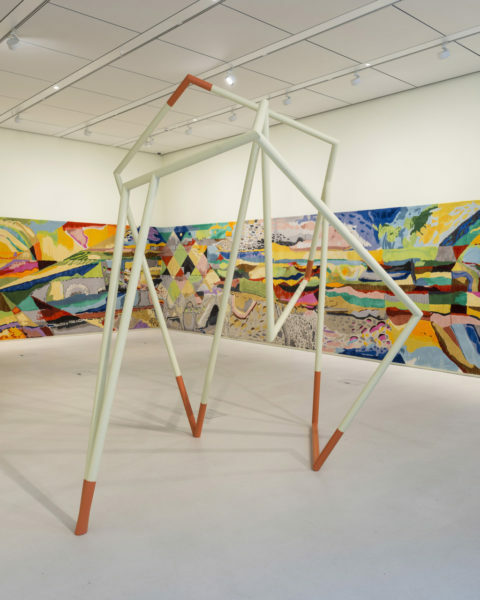 Image: Installation view of Isabel Nolan: Another View from Nowhen at Bloomberg SPACE. Courtesy of the Artist and Kerlin Gallery. It was a bomb, during the Blitz that helped to uncover the remains of the Roman Temple of Mithras in the City of London. With a certain theatricality, the story goes that the third century ruin only offered up an answer to its mystery on the last day of the excavation in 1954. A stone head of the God Mithras was found, which indicated the dedication of the temple. The central ritual of the cult of Mithras involves the slaying of a bull, depicted in the tauroctony, the relief carving usually found in the temples. No one entirely understands the purpose of the cult, nor who the adepts of the cult might have been, though it spread throughout the Roman Empire between the first and fourth centuries AD. It is known that the cult had its origins in earlier Persian worship of the god Mithra; that the rituals of the cult took place underground; that feasting was a part of the ritual. The cult may have been associated with the military, and it is estimated that there would have been at least 680 mithraea in Rome. The discovery of the site, so ancient and unknowable, captured the imagination of the public in the immediate postwar period and up to 30,000 people a day queued to view the ruins. In 1962 a reconstruction of the temple was unveiled nearby. It was much criticised for its inaccuracies and loss of architectural detail. When Bloomberg acquired the site in 2010 they were fully aware of the responsibility of looking after the structure and so since late 2017 one can now visit the London Mithraeum – for free, but by pre-booking a tour. Foster + Partners, the architects of the new Bloomberg HQ, have reinstated the Roman road of Watling Street, cutting diagonally through the building. The whole block sits over the course of one of London’s subterranean rivers: the Walbrook. Given the historical span of human activity on the site, the geological romance of the lost river, the drama of the uncovering of the mithraeum, the loadedness of the contemporary context within the gleaming towers of the financial centre of the country (I won’t say Europe), and the starchitect glister of the new spaces – you would need to find an artist with a laconic take on life to deal with the proposition of a commission. Isabel Nolan is just such a one, a deeply thoughtful Irishwoman. Nolan has not given in to the overwhelming mysteriousness of the site. “The universe is very extensive. London has a very rich history. Humans don’t live very long” she said in her remarks at the opening. Well, yep. You can’t argue with that. 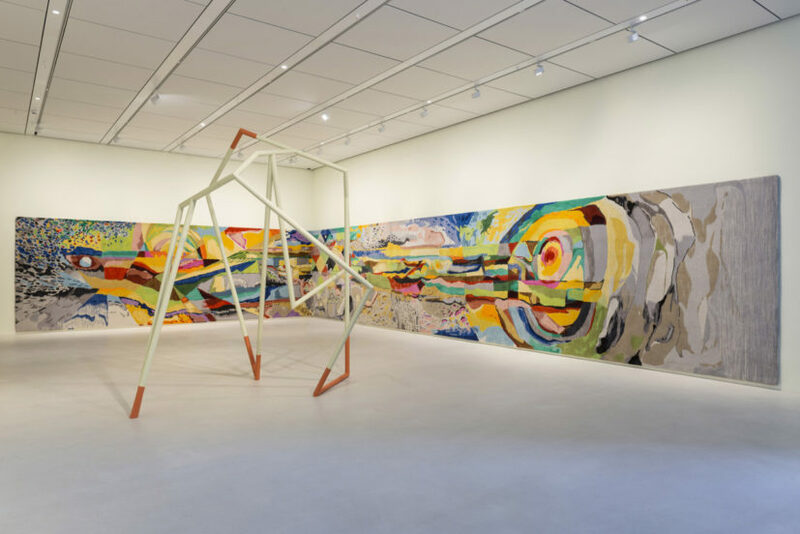 In responding to the site, Nolan has produced a vast tapestry (The Barely Perceptible Vibration of Everything) that cranks along two walls of the space, filling it with colour and muffling the acoustics to a pleasingly human tone. As source material Nolan sought out the diagrams of the site made by historians, geographers and archaeologists. She used these to inform watercolours that became the vast landscape that manages to convey both the geological and historical compression of the site and a kind of cosmic radiance that puts one in mind of Sonia Delaunay. 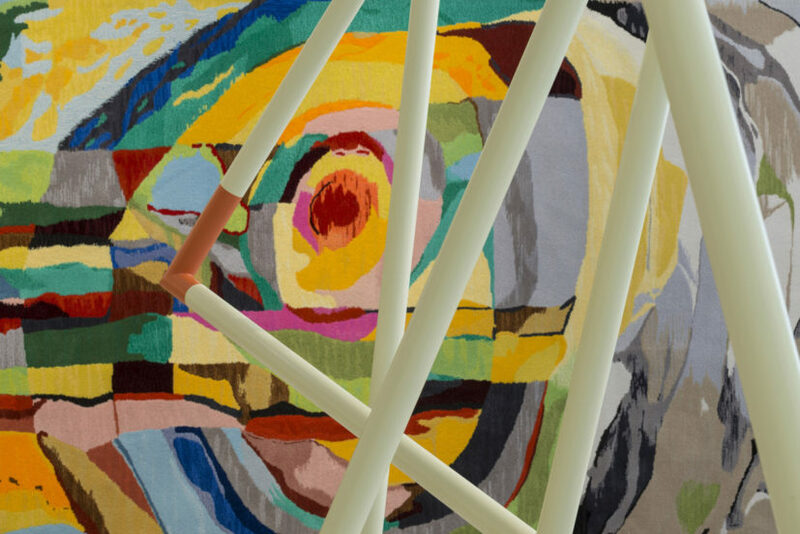 Alongside the tapestry is a sculpture, an abstraction of a bull, Blind to the Rays of the Returning Sun. An over life-size rendering in painted metal framework, its open, outline form echoes the dearth of information about the bull at the heart of the mithraic ritual. All we know is that it dies, over and over again. It is poignant, this potent symbol of man overcoming nature, or assuming its power, or sacrificing it to the gods of sun and moon. I would sign up to that.